Our group would like to thank the students of Burton Morewood C of E School for creating this beautiful poster which adorns the walls to the entrance of Burton In Kendal Motorway Services. Well done for such a brilliant poster and also for getting it shown in a place where thousands will see it. 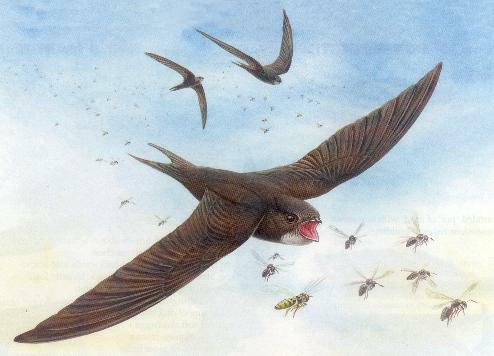 During 2015 one of our group Danny went along to the school and gave a talk to the students on our local Swift populations and maybe this poster in part results from inspiration gained from that talk. 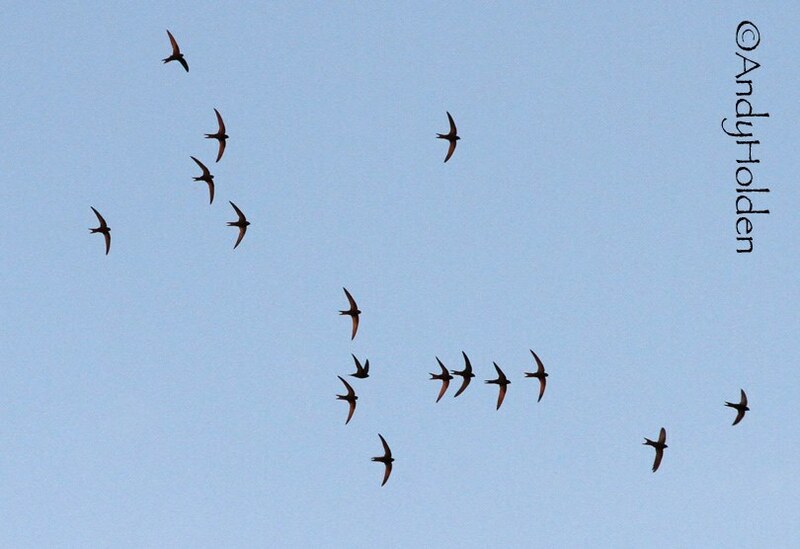 Tonight was without doubt one of the busy nights we have ever witnessed with Swifts everywhere you looked. We did manage to actually count at least 22 birds in the sky but I am sure this is on the low side there could well have been over 30. We do think a lot of these birds tonight would have probably been non breeders (eg first year birds doing their Reccy) The largest screaming group had 8 birds and was seen over near Coaching House. We checked out all the sites starting with the Post Office Block, then Cocking Yard, rear and front and SW wall of the Royal, also the rear of Neddy Hill Cottage (a new site), also from the back of the Kings we watched the large Old Mill for a while and then moved on to finish checking out The Coaching House and The Manor House. In regards to nesting we were fortunate to see birds entering nest sites on the rear of the Royal, lots on the front of the Royal Cottage, and also birds entering nest sites at the Manor House. 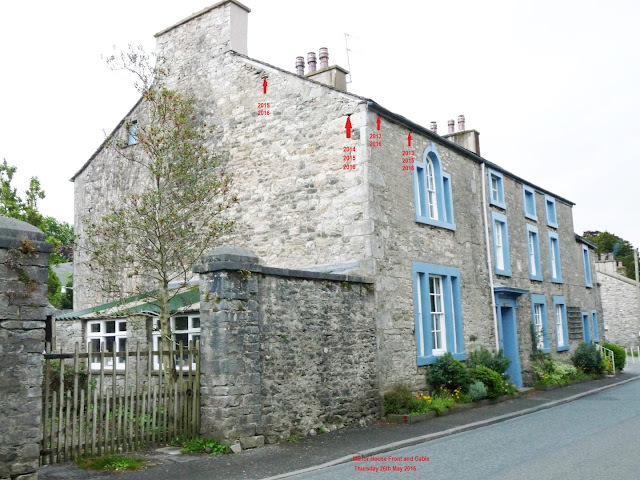 A new nesting site was shown to us by David Craig, who had witnessed a bird going into the nest area on the rear eaves of the Neddy Hill Cottage within David's yard. Of special interest is that we did map a bird prospecting this particular site last year. With this new site it brings this years tally up to a minimum of 17 sites. 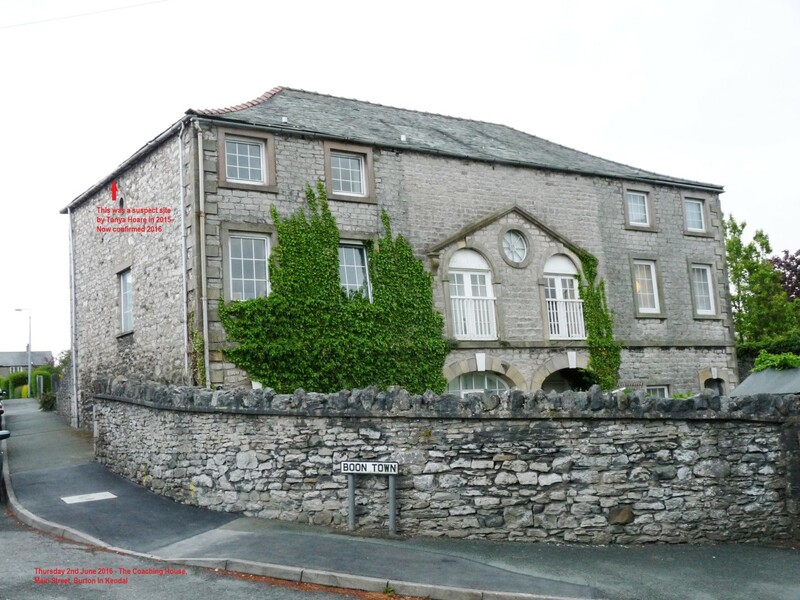 During the past week also observations have been carried out on the Office Block at Clawthorpe Hall and a further two nest sites have been confirmed on the rear annexe of the Royal Hotel. 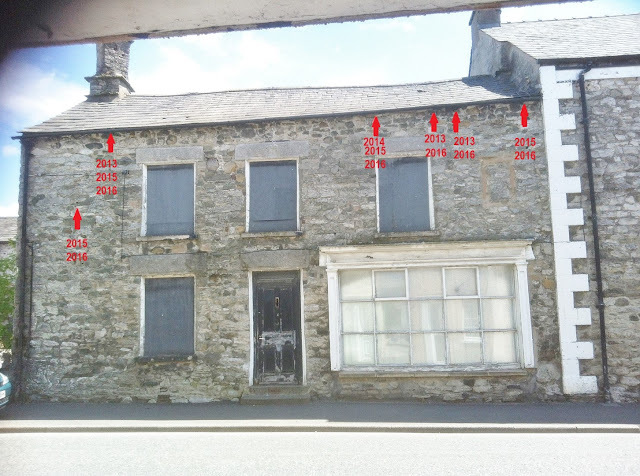 To try and give a clearer picture to the ongoing progress I have included below photos of the current status for this year at all occupied sites. Observers tonight were: David Craig, Reg Hesketh, Hugh and Sue Miles and Bryan Yorke. 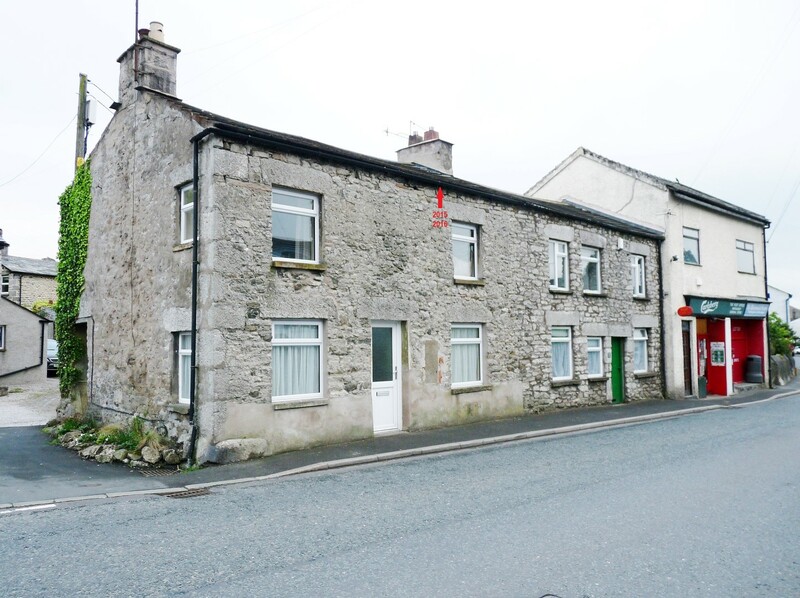 This site is one of a possible two for this property. The site to our knowledge has been used in all years since 2013. This year at first, we were worried about this site because of the new owners and the pointing renovations which have taken place. We need not have worried because thanks to Jane and the brilliant co-operation of the new owners, who happened to be totally Swift friendly, they left holes at the eaves so as to allow the birds access to their original nest sites which we now know they have taken up at least one of the known sites.. Always been a very productive site for such a small area. The sites already confirmed are marked in red. We are still waiting for a confirmation either way on the large hole which you can see towards the top of the building to the left and above the two sites already confirmed. We did witness birds banging at this entrance tonight so perhaps some activity me be taking place, time will tell. Also the next photo is a close up of the site on the return wall. Another of the Swift stronghold sites with six nest within the front of this building, plus we are regularly seeing more "banging" going on at other sections of the eaves, but so far only the areas marked in red are the only definites. This is a new site for us tonight. David Craig has seen a bird entering at the point marked with red. Also of particular note is that we did record a bird last year actually "banging" and what we took to be prosecting the site. Its now clear the bird did decide to take up this new residence. 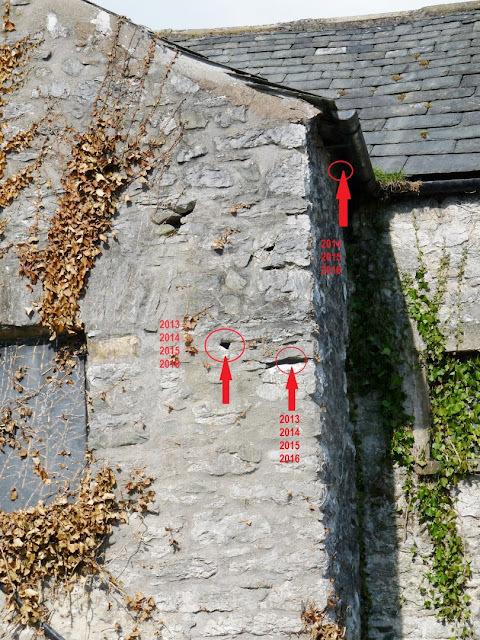 So far we have been able to established a definite breeding site on the side North Elevation marked with a red arrow just to the left hand side of the small round window. The Coaching House was only established as a breeding site last year in 2015 although we had seen birds prospecting back in 2014. Last year we did have birds also nesting again on the gable end side elevation to the far left hand corner close to the drainpipe. Also we did have a bird nesting to the front elevation between the two upper windows. The Manor House is yet another of our stronghold sites with at least four sites occupied this year. It is also suspected that there maybe more nest. We are ever so grateful to Mrs. Ellis and her family who are very interested in their Swifts and their progress. It was a great pleasure to visit this site, because we had suspected birds coming from around the back of Clawthorpe Hall in previous years. I was able to confirm at least one pair nesting which shows with the red arrow. Also at the same time there were six birds in the sky directly above the property which makes me think there will be even more nest which hopefully we will be able to ascertain when we do a group visit. 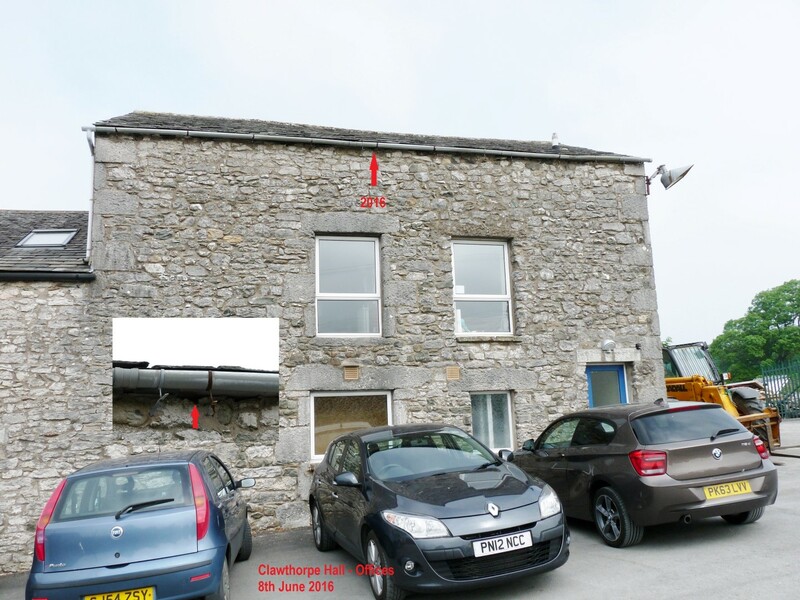 It was nice to meet up with Edward Duckett (MD of Ducketts Building Services) who so kindly pointed out the areas of where the swifts are nesting. He also loves to have the birds on his property and has purposely left the top guttering/eaves level open of pointing so that Swifts are able to return on a regular yearly basis.